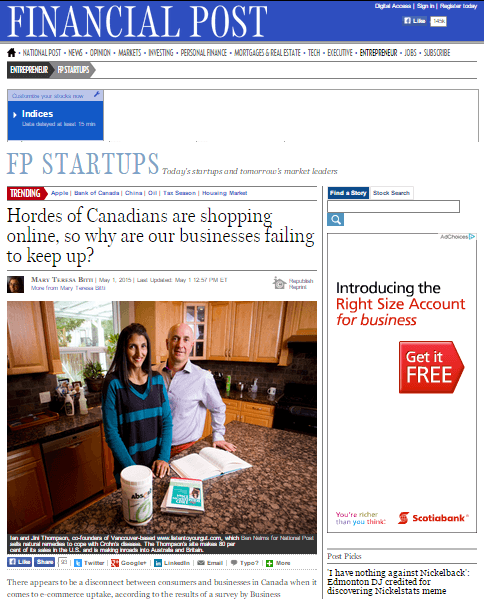 This article is important because, despite a lot of information out on the internet concerning the robust state of ecommerce in Canada (spoiler: we’re all shopping online), Canadian businesses aren’t online in the numbers they should be. As a followup to the Financial Post article, based on research VL has been doing for some time, we put together the following infographic with side-by-side statistics showing what consumers are spending and what Canadian business are doing – or not doing to earn those consumer dollars. The scarcity of good surveys and statistics on the subject makes the research we have done all the more important. We see this as a clarion call for action both by retailers, policy makers and consumers. As this infographic shows, Canadians are spending money online, but not with Canadian businesses. Canadians are spending with multinationals like Amazon, Costco and Walmart and the remainder of our purchases are out of country. Unfortunately Canadian businesses are doing very little to combat this. They’re not mobile-friendly, few have websites, and some don’t even have a web presence at all. So what can we do, as Canadians, to improve this situation? Creating an effective e-commerce strategy is one place to start; Robin H. Smith of VL gives some great tips at the end of the Financial Post article. Spreading awareness of this issue is also important. There are tons of infographics, websites, newspapers articles, and blogs that will tell you that Canadians are spending money online and how e-commerce is growing exponentially. But be critical of the data and the sources, as these can be manipulated to paint a pretty but false picture of the rosiness and future of Canada’s e-commerce economy both online and off. Want to learn more about how to master e-commerce for your business?